There are almost as many recipes for pizza dough as there are toppings but this is my favourite. Home-made pizza tastes so much better than the ones you can buy in supermarkets and, let’s be honest, from a lot of so-called pizzerias. This recipe is easy, even if you don’t usually make yeasted doughs, and it tastes terrific. You can top it with anything you please but if you use pineapple I may be forced to hunt you down and beat you with my pizza paddle. To make the pizza dough, mix the flours and salt in a large bowl. Dissolve the yeast in some of the tepid water and leave it for a few minutes to work. Make a well in the middle of the flour and mix in the olive oil and yeast. Slowly add the rest of the water, drawing the flour in from the sides until it’s all incorporated. Then remove the dough and slap it onto a floured work surface, kneading it well for around 10 minutes. Or you can duplicate this entire process in a food mixer with a dough hook. Once the dough is kneaded, rub a clean bowl with a teaspoonful of oil and place the dough inside. Cover with oiled clingfilm and leave it somewhere warm to double in size. This will take around three hours. Alternatively you can leave it to rise overnight in the fridge. 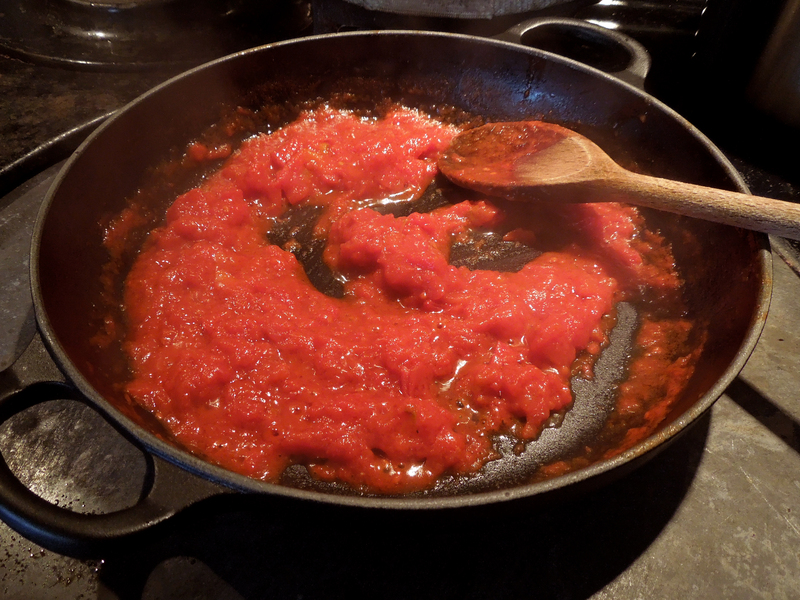 Meanwhile make the tomato sauce: put the tomatoes and oil in a lidded saute pan and cook for a couple of minutes on a medium heat. Remove the lid and continue to cook until most of the liquid in the tomatoes has boiled off and you have a thick puree. Season to taste with a little salt. Remove the risen dough from the bowl and divide into three equal-sized balls. Leave them for 10-15 minutes before putting a generous scattering of polenta flour on a baker’s peel (or a flat baking sheet) and rolling out to around 30cm/12″ diameter. If you want to get fancy, try stretching the dough the way professional pizza makers do it: roll it into a thick disc then drape it over your doubled fists, bouncing it in the air to turn it and stretch it. It’s easier than it sounds. Heat the oven to 230C/450F/Gas Mark 8 and at least 30 minutes before you want to eat put in your pizza stone or a baking tray to heat up. Unless you have an enormous oven and a very big pizza stone, you’ll probably have to cook the pizzas one at a time. 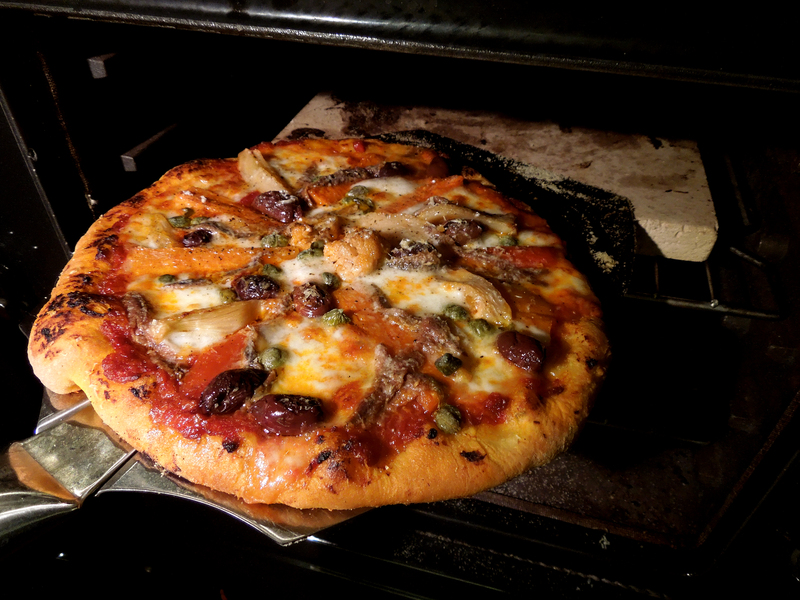 Slide the pizza into the oven and bake for around 10-12 minutes. You can add ripped up basil and a drizzle of olive oil just before serving. If you want to freeze the pizza bases give them five or six minutes in the oven, minus any toppings, to part-bake them then cool completely before bagging and freezing. 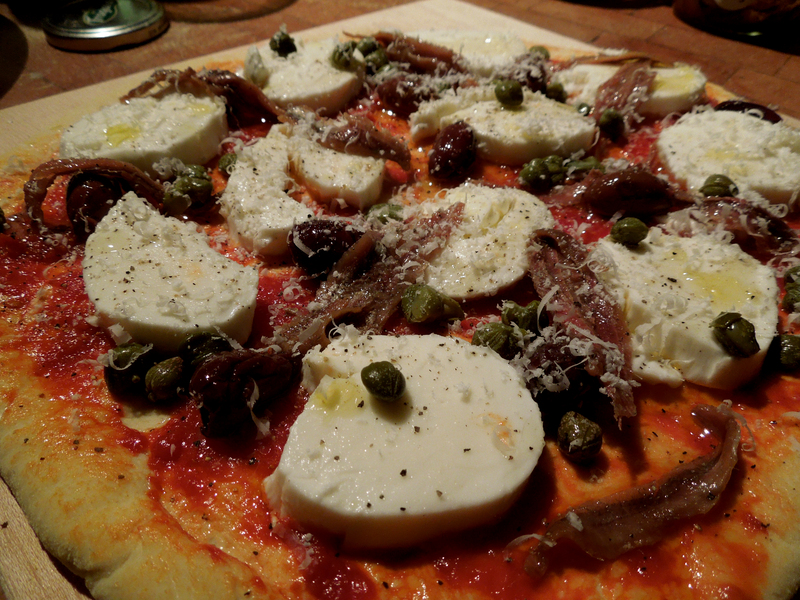 This entry was posted in Breads, Mains and tagged pizza dough, Portly Pizzas, tomato sauce for pizza by Linda Duffin. Bookmark the permalink. Interesting. I’ve never added polenta flour into dough before. I’ll give it a whirl. 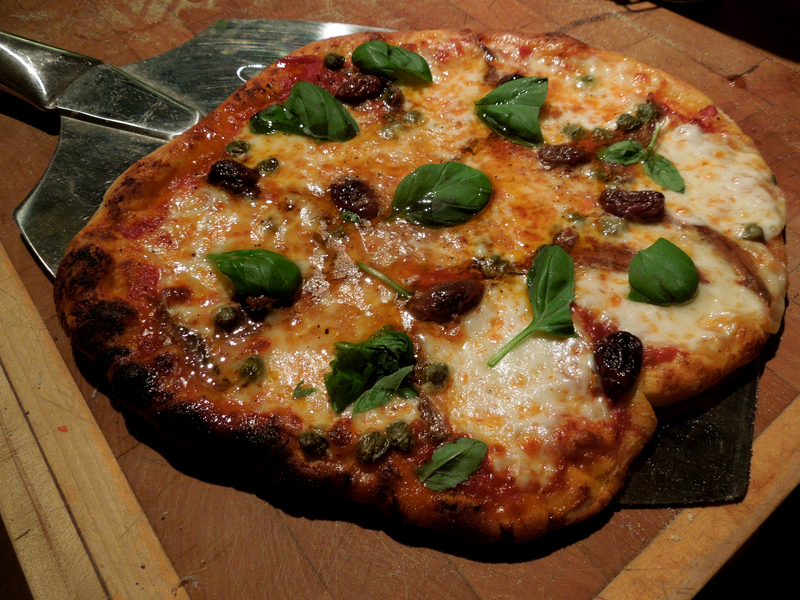 I like the flavour it gives and it doesn’t affect the elasticity of the dough. I’d be interested to know what you think. Excellent. The Wife makes a pretty decent pizza. I really should post it sometime. My favourite is sausage meat and fennel seed. I didn’t realise Mrs Bofin was actually allowed into the kitchen. 🙂 Sausage meat and fennel sounds great, must give it a go.